Word about “The Night Manager” had already stirred my interest in the 6-part television mini-series, though I did miss its broadcast premiere on AMC earlier this year. 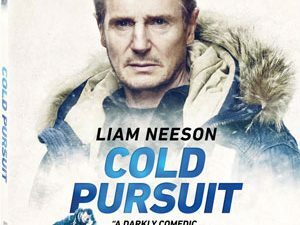 When Sony Pictures Home Entertainment announced a Blu-Ray version of the series, based on a novel by John Le Carré, I knew I had to check it out and see for myself what the buzz was about. British citizen Jonathan Pine (Tom Hiddleston) is the night manager at one of Cairo’s elite hotels during the years of civil unrest in Egypt. Catering to the rich and powerful, he fulfills the hotels’ guests every wish with a smile, perfect manners and an uncanny ability for small talk. One day, however, while on duty, he is exposed to secret information about an illegal arms deal so large it could completely upset the balance of power in the country. He leaks the information to a friend working for the British government from where the details percolates—back down to Cairo and its source. The backlash is fierce und entirely uproots Pine’s world. Six years later, Pine has found refuge in a small establishment deep in the Swiss Alps, hopeful that nothing bad would ever cross his path ever again when a new guest arrives. And it is none other than international arms dealer Richard Roper (Hugh Laurie), the same man who destroyed his life in Cairo. Torn between concerns for his own safety and the desire for revenge, Pine is not quite sure what to do—when the decision is made for him! To me, John Le Carré has always been the grandmaster of spy thrillers and while the métier has changed somewhat from his cold war thrillers of old, his contemporary works are every bit as engaging as ever. Full of twists and deep characterizations, his stories are not mere superficial spy stories, but human dramas that happen to play out against a thriller story. And it is this craftsmanship that permeates every scene of “The Night Manager” and instantly elevates it above more generic genre fare. The production features a great cast, set before magnificent locales that give the movie a grand feel as the story moves throughout Europe and the Mediterranean. Tom Hiddleston is magnificent in his part of Jonathan Pine. 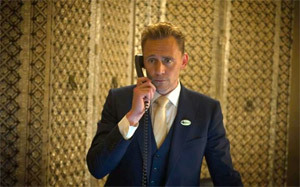 His boyish smile serves the hotel manager interfacing with his clientele absolutely perfectly, while the seriousness and darkness he already displayed in his portrayal of Loki in the “Thor” movies, is still lurking, turning the polite and polished character into a walking menace at the same time. Hugh Laurie is also a wonderful choice for the story’s antagonist because, like Hiddleston, he manages to remain charming on the surface while boiling with the icy disregard for others of a full-blown sociopath, always seeing himself above everyone else and above the law. The cast is rounded out with solid support characters that have been cast equally well, giving the story depth and bringing the world to life. Arriving on two discs, each containing three episodes of the 6-part series, the release offers up a 1080p high definition transfer of the show that is meticulously clean. Without any defect or blemish and devoid of any notable grain, the production looks more like a movie than a television production, really, especially when you also take the many exotic locations into consideration that build the framework for the story. The image is highly detailed, rendering every little detail with precious accuracy that help breathe life into every frame of the film. Colors are natural and never bleeding, yet vibrant and rich at all times. Whether it’s the gold-tinged interior shots of the Nefertiti hotel in Cairo, the cold interiors of the Whitehall offices or the warm vistas of Mallorca, the Blu-Ray version renders each setting with proper care and accurate colors. Black levels are deep, firmly rooting the image and giving it plenty of visual depth. Simply put, you couldn’t ask for a better presentation of this production. The release comes with a 5.1 DTS-HD Master Audio track that lives up to its promise with equal élan. While much of the film is dialogue-driven and doesn’t pose much a challenge in terms of the sound design, there are moments in the film when the events become more suspenseful or action-laden. It is in those moments that the track shows its prowess with incredible clarity across the entire frequency range. A solid bass extension gives explosion first-class rumble, while clear high ends make sure the production always maintains perfect clarity. Dialogues are well integrated and never drowned out. The release is entirely devoid of any extras, unfortunately, which is a bit surprising, given the high profile of the production as a whole. “The Night Manager” did not disappoint at all. It was every bit as good as everyone claimed and on this Blu-Ray version, which features the original uncensored version of the show, as shown in Europe, the production is really shining with excellence. Make sure to grab a copy of the release, if only to signal to the TV networks, BBC and AMC in this case, that there is a solid market for high quality, intelligent television productions, even if they do not feature dragons, zombies or excessive violence. I honestly wish there were more of this sort.